This is an addition to the last post. 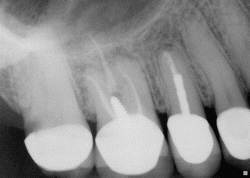 Once again, it is easy to put successful images up but sometimes it is not possible to find additional canals because they are so small and often calcified. I will address calcification in another post. I am adding this post to show that there are other teeth that can have missed canals. Upper first molars are probably the ones I see the most but almost any tooth can have an unusual anatomy. This one is similar to the previous picture. 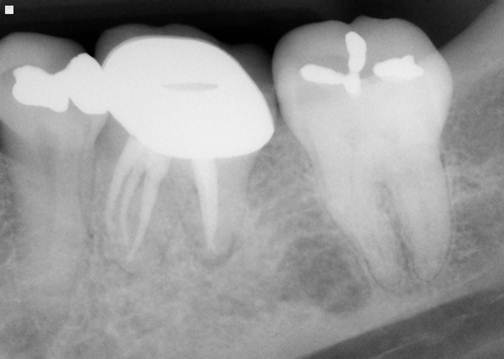 The same root on the right called MB2 has an additional canal. This is an upper first molar. This one is a bottom tooth. The really white part you see is the metal foundation of the crown. You can see the root on the left side in the second image has an additional canal treated which solved the pain problem for this patient. This last one is tooth #19 and it is a little less common. In the first image you see three canals treated. 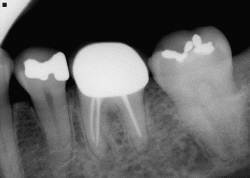 Most often there are 3 or 4 canals for this tooth. However, when there are 4 there are usually 2 in the mesial or front root (the one toward the midline of the mouth) and 2 is the distal or back root. 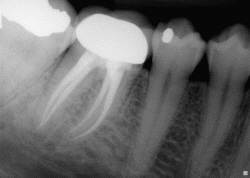 As you can see in the second film this one has 3 canals in the mesial roots (left root as you look at the picture). This canal is called the middle mesial canal (because it is between the other mesial canals). This is the type of canal that can lead to a tooth with 5 or 6 canals. 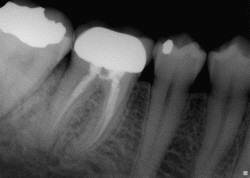 This is not very common but can often be the cause for a root canal that is not working. I recognized the image of the x-ray #19 tooth & u treated me this pass spring I want to thank u very much but now I think the tooth right by the one u did is giving alittle pain.. I need to set up appt with Dr. Matthew Binns ASAP to see if he can fill the that tooth or what? I appreciate ur work & ur education what u share on ur blog.. U have my info in my file still u can call me to see how I am doing to see if I have did the follow up with my dentist yet..TTYL Have Super duper week. Keep up your amazing work as well.. Sending u my prayers with u & ur staff... Ur Patient, Marissa N.
Wow, that's quite the info! I'd imagine that you'd see some pretty serious cases and perform crazy surgeries. 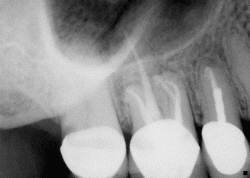 Endodontics is not very heard of but it's interesting! Thanks! When I had my first root canal treatment from my first dentist the treatment was really very uncomfortable and costly. And post the treatment I faced lot of problems. But on my friends recommedation I visited his dentist to get second opinion and cure my dental problem. I m so happy to come here, as the treatment was very painfree and comfortable. I have also shared my entire review on the experience over there.